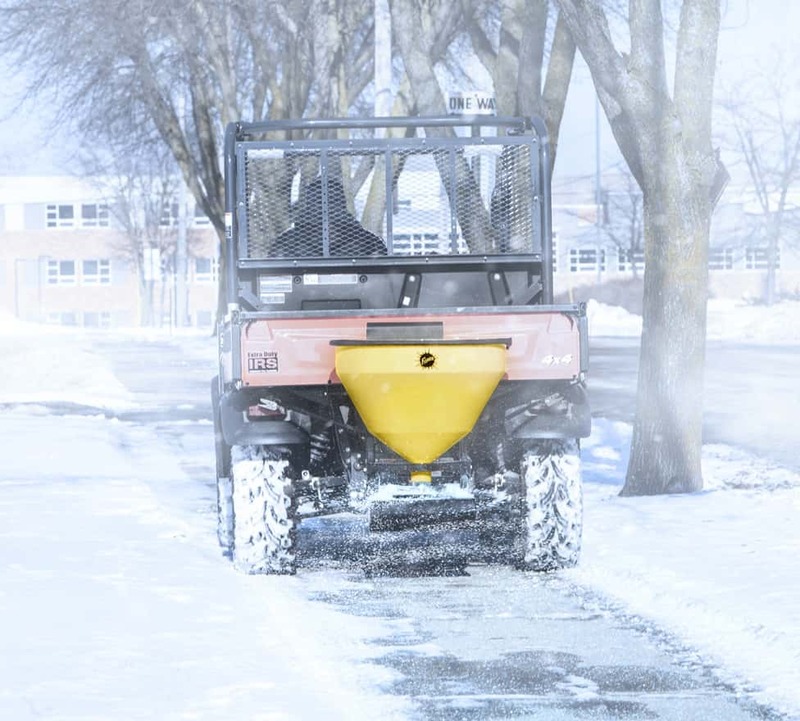 QUICK-CASTER™ 300W for Sale in Salem, MA | BRAKE & CLUTCH INC.
As the ultimate in “plug ‘n’ play” ice control, the FISHER® QUICK-CASTER™ 300W wireless electric tailgate spreader combines professional grade spreader performance with the convenience of wireless operation. Featuring a completely wireless key fob control, 7-pin connector, standard 2" receiver hitch, this polyethylene tailgate spreader has mounts available to fit 1 ton or smaller pickup trucks, SUVs, utility vehicles and tractors and is easy-to-install for home use or commercial ice control applications in Salem. The specially designed 1/3 HP, 12-volt electric motor and high-torque transmission are fully enclosed for protection from the elements. The completely wireless key fob control offers one-touch, on/off operation with two spinner speeds to match the spread pattern to the job. The QUICK-CASTER™ 300W wireless electric tailgate spreader features a corrosion-free poly hopper for long-lasting durability. The QUICK-CASTER™ 300W wireless electric tailgate spreader features a 10" spinner made of nylon/glass reinforced resin. It delivers a spread pattern of up to 25' and provides long-lasting, corrosion-free operation. The QUICK-CASTER™ 300W wireless electric tailgate spreader easily mounts to 1-ton or smaller pickups, SUVs, UTVs and tractors. The spreader comes standard with a 2" receiver mount. Additional mounts available include a drop utility, 3-point, trailer and utility mount. The Utility Mount is designed to bolt to the floor of a utility bed. The reinforced framework uses 8 bolts to attach to a utility bed and provides a sturdy 2" receiver for the QUICK-CASTER 300W to attach to. The Drop Utility Mount is a low-profile mount designed to position the QUICK-CASTER 300W lower for easier filling and better material control. The mount attaches to the bed floor of a utility vehicle with quick-connect pins for easy removal. The Trailer Mount for the QUICK-CASTER 300W allows you to tow your spreader with any utility vehicle. The rugged steel frame construction and heavy-duty pneumatic tires ensure that your spreader will follow wherever you lead. Easy to attach and easy to understand, the 3-Point Mount from FISHER® puts a 2" receiver hitch on the back of your tractor. Specifically designed for tailgate spreaders, this 3-point hitch mount has been tested to withstand the rigors of hauling heavy de-icing materials in demanding weather and terrain. Dimensions Overall (LxWxH) 22" x 30" x 32"